For real estate investors, it’s important to understand multifamily housing, which is an important category of rental property that can quickly build long-term wealth. So in this article, we explain the major types of multifamily housing. A multifamily house is composed of multiple separate housing units that are contained within one or several buildings in a single complex. There must be at least two adjacent housing units, either horizontally or vertically, to qualify as multifamily housing. Now, we want to talk about the basic types of multifamily housing. Apartment buildings and condominiums are the most common types of multifamily housing. These complexes contain multiple units, and often have multiple floors with multiple units on each floor. The main difference between an apartment and condo is ownership. 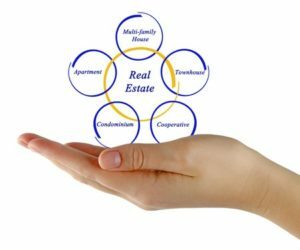 Generally, a condo is an individually-owned unit in a multifamily housing complex, with the common areas of the complex owned equally among all condo owners under the umbrella of an association. An apartment building, on the other hand, is wholly owned by a single owner, such as a corporation, that leases individual units to tenants. A townhouse is an individually-owned unit that mimics a detached home; however, it is attached to one or more townhouses. A townhouse usually has multiple floors, and commonly sits side-by-side with another townhouse, each with their own private entrance, rather than having only one level and/or having access via an interior hallway or via an outdoor walkway. In the U.S., the term “apartment” most often refers to rental property, whereas “townhouse” refers to an individually owned home. However, the term “townhouse-style apartment” is sometimes used, which can be a bit confusing. Townhouses can also be “stacked,” with some units, often two, stacked vertically. These units usually have their own private exterior entrance. A duplex is one building divided into two separate “houses,” which are usually side by side. Each unit has a separate entrance, and there are usually no common areas inside the duplex. Triplexes and quadruplexes are similar to duplexes, only they have more units. A triplex has 3 units, and a quadruplex has 4 units. A mixed-use building is used for multiple purposes that can include residential, commercial, cultural, institutional, or industrial uses. Commercial spaces on the lower floors, and residential spaces on the upper floors. Commercial spaces in the front, and residential spaces in the back. Graystone Investment Group is a real estate wholesaler of single-family and multifamily investment property. We have researched the Tampa Bay area neighborhood-by-neighborhood to determine where investments are likely to have the most most return on capital.